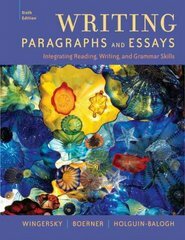 Writing Paragraphs and Essays 6 Edition Master writing paragraphs and short essays with WRITING PARAGRAPHS AND ESSAYS, 6e. Successfully class-tested by thousands of students, this new edition shows you how to create effective introductions, support paragraphs, and strong conclusions. Learn smart strategies for organizing and presenting your ideas and use real examples from students and professional writers to help guide your work. Take your skills to the next level with exercises designed to reinforce key concepts and boost your confidence as you apply them to your writing.